Does this not sound strange? Does this mean we do not need our eyes to see and appreciate the world around us? As humans, we rely heavily upon visual input to help us navigate through the world. Although, our vision plays a dominant role over the other senses in helping us appreciate the environment, it is not without limitations. 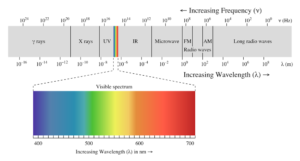 The visible light that enables us to see things around us makes up a very small portion of the full electromagnetic spectrum. 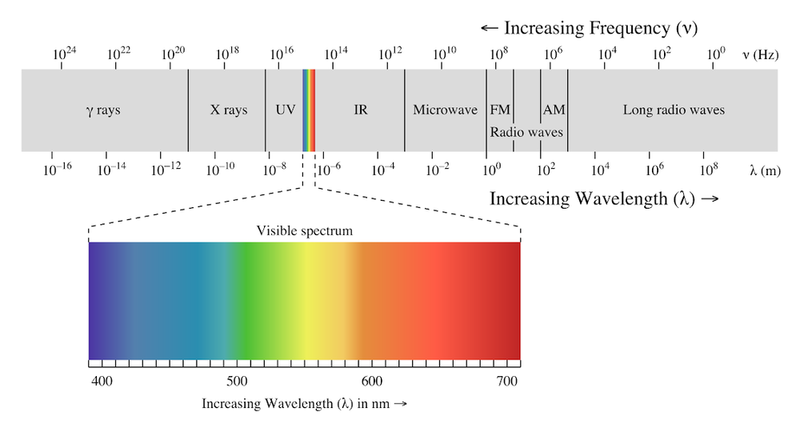 Between the very short gamma waves (below 100 pm) on one end and the longer radio waves (above 1m) on the other end, the visible light occupies a very narrow space (in the frequency of 400 nm to 700 nm), sandwiched between ultraviolet (10 nm to 400 nm) and infrared waves (700 nm to 1 mm). Honeybees can see in the ultraviolet range while snakes can sense in the infrared range. We, humans, on the other hand, can’t see objects outside of our visual range because we don’t have the biological receptors needed to pick it up. In his TED talk, Neuroscientist David Eagleman says that “Our experience of reality is constrained by our biology”. In other words, we are only experiencing a very tiny fraction of what is actually out there. But what has all this got to do with seeing or not seeing through our eyes? ‘This doesn’t make any sense’; some of you may be wondering. So far, we learnt that what we see through our eyes is but a small part of the actual reality and that there is a lot more out there. There is scope for enhancing our vision through use of technology, like use of infrared cameras or X –rays in understanding those that are normally not visible to us. The reality seems to be much larger that forces us to explore technology and other means to continually enhance our appreciation of reality. <pstyle=”text-align: justify;”>Your ability to see the object in front of you at this moment is the result of a long, but lightning-fast sequence of events- Light bounces off the object and then passes through a protective sheet called the cornea and then moves into the lens which focuses the light onto the retina. 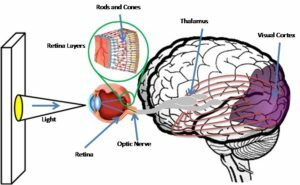 The retina transforms this energy into neural messages that are relayed upon the rear portion of the brain, called the occipital cortex. Here the brain processes and interprets into what you actually see. So in the case of blind people, they usually don’t lose the ability to see. Instead, they lose the ability to transmit sensory signals from the retina to the brain. Their visual processing pathways are still intact which means that even though the person has lost the ability to receive data from the retina, they can be relayed through alternate sensory pathways such as touch, sound or smell. Hence, the term sensory substitution. This essentially proves that it is the brain that is responsible for this final perception, and not the senses. Our eyes are merely a portal through which data from the environment is collected and sent to the brain for processing in the form of pulses. The brain is a highly intelligent system that can extract streams of data from anywhere and can use it to make sense of the world. This means the brain is able to take information from touch or from the ears as if it were coming from the eyes itself. Sensory substitution devices take advantage of this by making use of the remaining senses to provide blind people with a sample of the visual world that has been translated into another sensory modality (one which isn’t defective) via specific algorithms. <pstyle=”text-align: justify;”>You can even see using your tongue. While it might sound crazy to see using your tongue, you have to keep in mind that your sensory organs are merely portals that pick up information from the environment and translate them into electrochemical signals. Now, the brain doesn’t care where it gets the information from as long as it’s in the form of electrochemical signals. So, the inventors of Brainport (sensory substitution device) developed a device that converts images into small electrical bursts on the tongue. A small array containing electrodes sits on the tongue and receives input from a video camera attached to a pair of sunglasses. The visual signal is processed by a computer in the device and is spit out as electrical signals on the tongue. Erik Weinheymayer went blind when he was 13 years old but that didn’t stop him from climbing Mount Everest. With the help of Brainport he was able to see the mountain terrain with his tongue. The device enabled him to judge the depth, size and distance of his surroundings with the help of vibrations that he felt. All of this is possible because our brains are incredibly plastic. What this means is that it can change both at a structural level and at a chemical level, in response to stimulus from outside. Structurally it can change by changing connections between neurons and chemically by changing levels of neurotransmitters and hormones throughout our lifespan. For many years, researchers used to think that no new brain cells are created after early childhood. New research, on the other hand, shows that thousands of new neurons are created on a daily basis, even in adults, especially in areas of the brain responsible for learning and memory. This ability of the brain to reorganize itself can also be used to adapt and change to new situations. 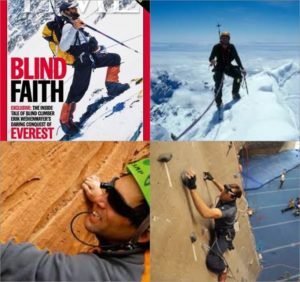 For example, it has long been known that blind people can compensate for their lack of sight by learning how to use their other senses better such as their hearing for instance. But it doesn’t just end here. Scientists discovered that for people missing one sense, their brains underwent a makeover (without any external device) which allowed the area of their brains normally devoted to handling that particular sensory information not to go unused. Instead, those same areas started to process other senses. In a blind person, areas of the brain typically devoted to processing vision (visual cortex) start to process information gained through touch and sound. Sensory substitution devices work based on the same principle but at a more advanced level. For example, neuroscientist, David Eagleman has designed a VEST (Variable Extra-Sensory Transducer) that changes sound into patterns of vibrations that can be felt on the torso allowing deaf people to hear. Beyond applications for hearing, the vest is programmed in such a way that it can translate any type of sensory input into patterns of vibrations. It’s not long before we can use this kind of technology to literally “feel” data in any form by the addition of new senses. Eagleman calls this the “new brain”-the kind of brain that receives input far beyond our traditional senses. But what if we already possess the ability to do so without the use of technology? After all, we all rely upon our gut feelings to make decisions from time to time. This gut feeling is referred to using many names such as the sixth sense, intuition or extrasensory perception. What if we could harness and develop this superpower with the help of deliberate practice? Most of the activities we carry out on a daily basis, whether it’s walking, driving or swimming, are done in autopilot mode. This is a result of years of practice that lead to physical changes in the brain, through circuitry of neuronal connections, allowing us to carry out these activities without conscious effort. For example, take the game of cricket or baseball where the batter has only about one fourth of a second to make contact with the ball. In that time, the batter has to be able to process and carry out a long sequence of movements in order to hit the ball without having the time to plan consciously All of the activities we carry out on a daily basis are actually difficult but when you go on practicing a skill, repeated signals are passed along neural networks, strengthening your synapses and eventually burning that particular skill into your brain’s circuity. Now imagine being able to use your intuitive power just as easily. And can intuition be trained and strengthened for improved observation and judgement and navigate through the daily life seamlessly and more efficiently. Experts refer to heart-based and intuitive leadership. With the wealth of information around us to make choices effectively and efficiently, the dependency on our senses and intellect will have to give way for more refined perception such as intuition. Can brains be wired to make us intuitive beings? Scientists seem positive. There are experiments within Brighter Minds to enable children to pause, to be intuitive and use heightened observation for better performance and functioning. The age old skill of pausing and feeling intuitively before acting, is fast disappearing in the current day lifestyle. It’s time we bring it back into our lives and into our children’s lives, so we can continue to nurture the dream of a brighter future and world for one and all. Bach-y-Rita P, Kercel SW. Sensory substitution and the human–machine interface. Trends in cognitive sciences. 2003 Dec 1;7(12):541-6. Carbon CC. Understanding human perception by human-made illusions. Frontiers in Human Neuroscience. 2014 Jul 31;8:566. Stiles NR, Shimojo S. Auditory sensory substitution is intuitive and automatic with texture stimuli. Scientific reports. 2015 Oct 22;5:15628. Collignon O, Champoux F, Voss P, Lepore F. Sensory rehabilitation in the plastic brain. In Progress in brain research 2011 Jan 1 (Vol. 191, pp. 211-231). Elsevier.